Soft, fluffy, baked chocolate donuts with crushed Oreos, topped with a thick cream cheese icing and even MORE crushed Oreos! You guys, this is just too decadent. Cover your eyes. Look away! I dare you to make these and just have one. It’s impossible! It’s 1am on a Friday and, my friends and I are leaving the bar. Sounds like the beginning of Piano Man, huh? In the parking lot, one of my friends says, “Ok, guys, so are we really doing this?” My friends want to take a quick road trip to our second home – Disney World! We’re annual pass holders and only live 3 hours away. We would literally have to be in the car in a few hours to fully enjoy the day. “Hey, you guys want an Oreo donut? !”, I changed the subject. Who brings Oreo donuts on a night out with friends? THIS GIRL. I grabbed two from the car and hand them out. “You like the Oreo donuts, really?! They’re not too sweet or too chocolatey? !” They nodded and gave me a thumbs up as they devoured them. As I’m getting dropped off at home, thinking this was one of those things you talk about but never really do, we get a call confirming if this road trip was happening or not. “No, guys, let’s do it another day…”, I said, being the methodical planner that I am. I stuttered and said nothing. I actually had TONS to do the next day but it was a surprise for HIS birthday so I couldn’t say a thing! Do you know how hard it is to keep a secret that big!? We had been planning his Drake themed surprise party for 3 weeks! Carpe diem, amirite friends? Or was it peer pressure? Who cares, I was going to Disney World! The one thing I forgot to give my friends in the parking lot that night, as we planned our spur-of-the-moment rendezvous, was a glass of milk! These Oreo donuts are soft, fluffy, chocolatey, and super sweet. Almost like a cake in donut form! It’s the perfect treat to celebrate an impromptu trip to the Happiest Place on Earth! In case you’re wondering, we left at 6am, after grabbing a few croquetas at a Cuban bakery, of course. We had an amazing day in Disney! Sometimes you can’t think. You can’t plan. You just have to take the opportunities that are presented to you and go for it! 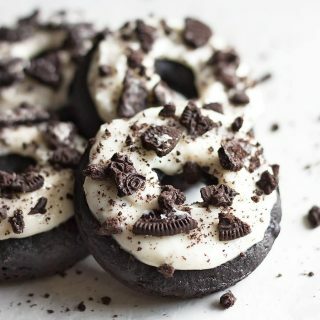 Cheers to many more spontaneous road trips, and more indulgent recipes like these baked Oreo donuts! In a bowl, whisk together the cocoa powder, flour, sugar, baking powder, baking soda, and salt. Set aside. In another bowl, whisk together the eggs, milk, vanilla, and vinegar. Add to the dry ingredients with the melted butter and crushed Oreo cookies. Stir until combined. Scoop the batter into a ziplock plastic bag or piping bag, cut a hole in one corner, and pipe the batter into the donut molds, filling about 3/4 full. Bake for 10 to 12 minutes, or until a toothpick inserted into the center comes out clean. Let cool for 5 minutes before flipping the pans upside down over a rack to remove the doughnuts. Whisk together the cream cheese, sugar, milk, and vanilla until smooth and combined. The mixture will be very thick. Dip the tops of the donuts in the icing or use the back of a spoon to spread a thick layer. Sprinkle with crushed Oreo cookies before letting set for about 20 minutes, or until the icing is slightly hardened. I love everything about this post! 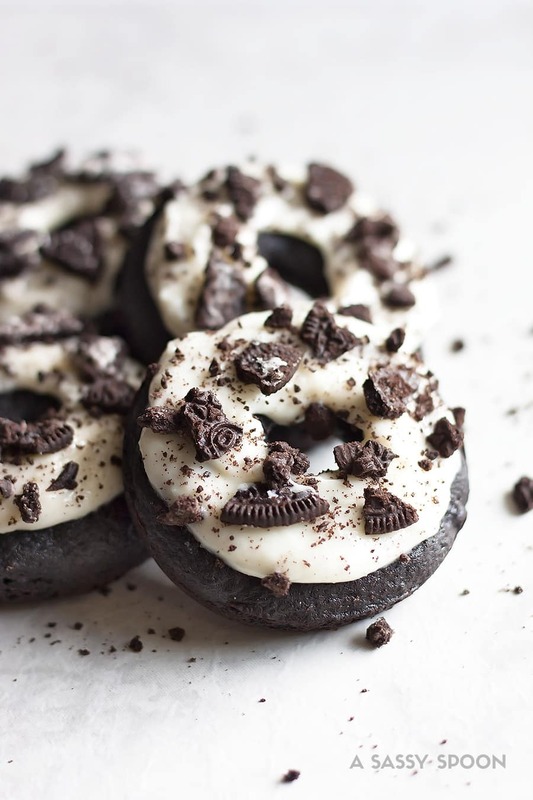 Disney, the oreos, donuts… it’s perfect :) Thanks for sharing this awesome recipe.